Well, this list includes pretty much anything I can find a coupon for. Where I really want to stress though is toiletries. You can ALWAYS find free shampoo, conditioner, toothpaste, toothbrushes, floss, razors, and other items at drug stores. That 5 pound bottle of shampoo may be a good deal, but when you can get it for free, any other price is too much! One of my mother’s favorite deals is on steak sauce. She used to buy the giant bottles at Costco, until she came across a coupon for $1 off any size bottle. She then bought the little tiny bottles of steak sauce that are priced around $1.25. Buying several of the smaller bottles was a much better deal than buying one giant bottle simply because she could use a coupon on each bottle, and now she is well-stocked on steak sauce! Now, I don’t know about you, but I am never able to find this mysterious deal that gets you free toilet paper. 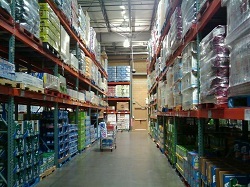 If I can’t find a good enough deal on toilet paper, then that is something I am willing to pick up at warehouse stores. My family is big on Charmin, and all I ever get in the paper is a coupon for 25 cents off. I know that I’d save more going to Costco and not using the coupon than going to somewhere like Target where the price is more, but I could use my little 25 cents off coupon. The same goes for paper towels, too. The other items in this list include anything that doesn’t regularly have coupons. I’m talking about produce, meat, and those delicious muffins, just to name a few. I think the main thing to consider when shopping at a warehouse store is this: do you save enough money to justify the cost of membership? For me personally, once I started couponing, I didn’t go to Coscto often enough to make it worth it, so I ditched my membership, and I haven’t looked back once! Thank you so much to you and Jennifer for coming to San Diego and sharing your couponing tips with us. I have been couponing for years, yet I did learn a few new things from you. I also really appreciate the tip resource emails I am receiving, that advise us what coupons are available and where we should go to use them to get the best deal. That has made a major difference for us. I do have to disagree with you about giving up a membership, because there are a lot of us that have it strictly to get the best price on prescribed drugs. For people like me who have been laid off and have lost their medical insurance, it is the only place where I can afford to purchase my medications. Just the purchase of one medication at Costco and the difference from say a CVS purchase, can easily justify a membership cost. So when you are speaking, you may want to preface your comment with a statement about using Costco’s Pharmacy. I also disagree with you about purchasing Charmin and paper towels at Costco. I have checked those prices over a long period of time as in years, and I have NEVER found Costco to have a better price on those items than any of the grocery stores, if we buy them when they are on sale in a grocery store. I suppose it is possible that that only applies in the San Diego area, but I have lived in many other areas and states, and have found that to be the case there as well. Again thank you for all you do to help all of us out here trying to make ends meet!! I hope you, your family, Jennifer and all of your staff, have a Very Merry Christmas and a Safe and Happy New Year!!! Jo Ann — I so appreciate your comments! To have a membership or not is such a personal thing — it totally depends on what you and your family purchase. Thank you for these thoughts, honestly in all the years I had a Costco membership I never even thought of getting a prescription filled there! Thank you for letting me know the newsletter and deal ideas help you. I often wonder if they are helpful to my readers. What about tissues? Is it cheaper to buy them at a warehouse store?